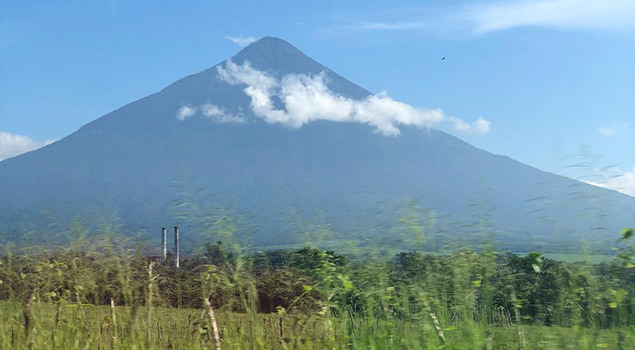 The medical mission team, pictured here in La Reina, included personnel from Guatemala, the Dominican Republic, Cuba and The U.S.
On June 3, 2018, the Volcan de Fuego, one of Guatemala’s many active volcanoes, exploded with catastrophic consequences. The disaster left more than 3000 people displaced, 332 people dead and 246 people missing. First responders and aid flowed to the villages immediately after the eruption, but four months later, this assistance has diminished to a trickle. To show solidarity with the victims, National Nurses United’s Registered Nurse Response Network (RNRN), teamed up with the Guatemalan-based, Fundación Amancio Samuel Villatoro (FASV), to conduct a much-needed medical mission from Oct. 26-28, in the communities of El Socorro and La Reina, a few kilometers from ground zero. The medical mission included the participation of New York State Nurses Association (NYSNA), Filipino American Healthworkers Association/FAHWA, International League of People’s Struggle (ILPS) and the Fundación Augusto Turcios Lima. The medical team included one doctor and 20 RNs from the US, including one nurse practitioner, and the president of the Dominican Republic’s National Association of Nurses. The team also included five doctors, three dentists and a pharmacist from Guatemala and four physicians from the Cuban Medical Brigade. During the three-day intensive mission, the nurses and medical providers cared for 1,075 patients, including 453 children 12 years or younger. Volcan de Fuego as viewed from La Reina, one of the towns where the RNRN clinic was held. RNRN team lead for the mission, RN Maria Rojas, traveled from Tampa, Florida, where she works in the ICU at the James Haley VA. “The conditions they were living in before the eruption, were already problematic, but after the eruption things were made so much worse for them,” explains Rojas. “We saw a lot of stress-induced issues: headaches, bronchial and other lung issues, people complaining of not being able to sleep. They were having a lot of lot of signs and symptoms of gastritis and gastro-esophageal reflux. We also saw children with parasites because many of them don’t have shoes.” Rojas and the other nurses witnessed firsthand the challenge residents face in maintaining hygienic conditions due to restricted access to potable water. On the first day of the clinic in El Socorro, RN Samara Lucas, worked as part of the triage team, tending to the hundreds of patients that lined up from early in the morning and throughout the day. “My mom grew up very poor and she always told me how she benefitted from clinics like this when she was growing up in Nicaragua. Her stories made me have a really big heart and I told myself, that once I became a nurse I was going to do whatever I could to give back to the Latino community,” shared Lucas, who works in the Bone Marrow Transplant Unit at UCLA Medical Center in California. RNRN is a project of the NNU and the California Nurses Foundation, a 501(c)(3) nonprofit. A national network of direct-care RNs powered by National Nurses United that coordinates sending volunteer RNs to disaster-stricken areas where and when they are needed.